Will John Frusciante Ever Return To Red Hot Chili Peppers? The former guitarist was spotted hanging out with Flea last weekend, but what are chances of him ever rejoining the band? John Frusciante first joined the Red Hot Chili Peppers at just 18 years old, following the death of Hillel Slovak in 1988 due to a heroin overdose. 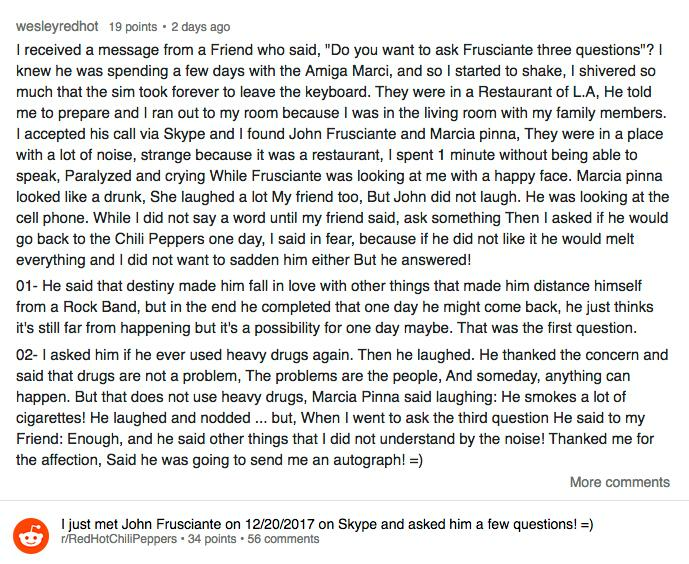 Frusciante went on to battle his own heroin addiction, which - after leaving the band in 1992 - almost cost him his life. Despite re-joining the band in 1998 and going on to release Californication in 1999 followed by By The Way in 2002, Stadium Arcadium (2006) was to be the last album he recorded with Anthony Kiedis and co. While it seems since his official departure from the band in 2009 that the California funk rockers had finally found a fit in Josh Klinghoffer, there may be fresh hope that Frusciante could return to them once more. As Alternative Nation reported back in February, a fan on Reddit recalled his amazing chance to speak to the guitarist via Skype thanks to a favour from a friend. In the account, wesleyredhot claims he spoke to the rocker and quizzed him on whether he'd ever re-join the band. He then revealed his response, noting: "He said that destiny made him fall in love with other things that made him distance himself from a Rock Band, but in the end he completed that one day he might come back, he just thinks it's still far from happening but it's a possibility for one day maybe." Months later John and Flea renewed fans' hopes once more by appearing together at an LA boxing match, and being photographed in public for the first time in over a decade. While there's nothing to suggest it means anything for John and the Californian band, we can but live in hope.